Audiences and students throughout the world have enjoyed Joseph Lulloff's performances and teaching in both classical and jazz idioms. Each year he gives numerous solo performances with student and faculty, ensembles, as well as with professional orchestras and artists throughout the world. Joseph Lulloff is Professor of Saxophone at Michigan State University. During the summer, he is on the teaching faculty at the Brevard Music Center as teacher/artist in residence. Lulloff received his B.M. and M.M. degrees in saxophone performance from Michigan State University, where he studied with James Forger. After serving as Assistant and Associate Professor of Saxophone at the University of Illinois, he returned to Michigan State to assume the position of Professor of Saxophone and Jazz~ Studies. His dedication to teaching earned him the prestigious TEACHER/SCHOLAR AWARD from MSU, and, many of his students have received teaching and performing positions throughout the United States. Energy, intensity, and artistry characterize all of Lulloff's performances, from jam sessions to classicalt concerts. Early in his career he presented his New York debut at Carnegie Hall as a winner of the Concert, Artists Guild International Competition. Success at the Pro Musicis International Music Competition showcased Lulloff in several major venues throughout the world. 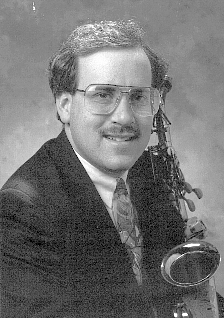 Lulloff performs frequently as saxophonist with the St. Louis Symphony Orchestra, the Minnesota Orchestra, the Grand Rapids Symphony, the Flint (MI) Symphony Orchestra, Lansing Symphony Orchestra, the Lansing Concert Band, and the Michigan Ragtime Orchestra. These and numerous other groups have showcased his talents in many cities. Lulloff's music has reached international audiences as well. He presented solo recitals at World Saxophone Congresses in Valencia, Spain; Tokyo, Japan; and Nuremberg, Germany. As well, he has performed on several occasions throughout, Japan with jazz pianist Phil Strange. As a guest artist with the Prism Saxophone Quartet, he performed soprano saxophone during their 1995 South American tour. Professor Lulloff's recent engagements this concert season include presenting master classes and recitals at the Southeastern Saxophone Workshop, the Louisville Saxophone Workshop, the Michigan Saxophone Workshop and numerous concert venues throughout the United, States and Canada. .
Channel Classics Records has just released "Interplay", a CD of saxophone music featuring saxophonist Joseph Lulloff and pianist Philip Hosford. This classical/contemporary recording of saxophone literature, which features the music of Francis Poulenc, Ralph Vaughan-Williams, Alfred Desenclos, Paul Cooper and Charles Ruggiero; is currently available world-wide on the Channel Crossings label. Recently, Arizona University Recordings released a compact disc featuring Professor Lulloff performing the saxophone concertos of Ingolf Dahl, Charles Ruggiero and Michael Colgrass (AUR 3099). He has also been active in commissioning numerous composers, including, Gunther Schuller, John Harbison, Michael Colgrass, Daniel McCarthy, Charles Ruggiero, Phanos Dymiotis, Zack Browning, Charles Lipp. Klonos (1993), a Greek word, refers ---says Swerts---to "a cramp-like contraction of the muscles, associated with the heavy movements that some saxophonists make during the fire of playing (for example, think about free jazz)..... The work is....a bravura-like fantasy with a more subtle, yet intense middle section. Klonos finishes with a wild, even more virtuosic reprise. For the gifted saxophonist, it is quite a ride." Klonos was commissioned by the Foundation Dr Ir.Th. P. Tromp Muziek Concours for the Benelux at Eindhoven. It was specially written for the 1994 Tromp Muziek Concours. During my long musical association with Joseph Lulloff, I've been fascinated with and inspired by many aspects of his performer's talents, his musical personality, and his on-stage mannerisms. One of Joe's signatures as saxophone soloist is his proclivity to move around while playing. Nearly at the very inception of this compositional project, I decided to write Sizzlesax for tenor saxophone and cymbals, with the cymbals to be played by the saxophonist. The image of Joe playing the tenor saxophone, surrounded by, tapping, dodging, and sometimes colliding with cymbals of various sizes and timbres (some of which would be "sizzle" cymbals) was one of the first generating ideas of the composition. Having a wind player play percussion instruments certainly is not a new idea, but as I began to think about writing this composition, I was excited by the possibilities of mixing the sounds of the tenor saxophone with those of cymbals. Particularly the combinations of articulations, volumes, and washes of sound of a set of cymbals, with the many exotic timbral, articulative, and dynamic shadings of saxophone multiphonics, seemed to have much potential for the creation of quite distinctive (and even new) sax-cymbal textures, colors, rhythms, and gestures. It's my hope that the attentive listener will judge that I've succeeded in realizing that potential.